Every good college student knows that a coffee shop serves up more than just coffee. A good coffee house is a place to study, to spend long hours reading and to hang out with friends. When your roommate has driven you just crazy enough that you have to get out of the dorm, or you’re going on your 23rd hour in the library, the local coffee joint can provide a nice change of pace and a much-needed caffeine boost. We’ve got the goods on where to go in Santa Cruz to find delicious and affordable coffee, a great atmosphere and most importantly, free Wi-Fi. 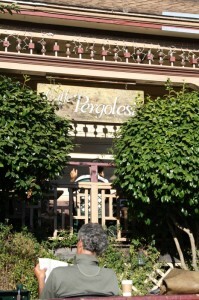 If you’re a UCSC student, odds are you’ve been to Perg’s. The renovated Victorian sits on the corner of Cedar Street and Elm Street in the heart of downtown and is one of Santa Cruz’s most well-known coffee shops. In addition to coffee, the café serves beer and wine, and as far as snacks go there’s something for everyone. 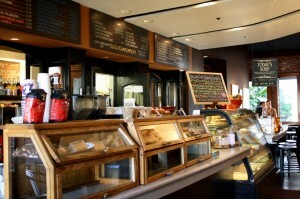 The menu has plenty of options for vegan and vegetarian customers, including pastries and sandwiches. For serious studiers, two rooms filled with tables provide a quiet place to work, while others looking to socialize have their choice of the plush sofas inside or on the outdoor patio. Perg’s also features work from local artists and musicians, making it more than just a place to get your coffee fix. No one in Santa Cruz does coffee house atmosphere quite like The Abbey. Vintage couches and chairs fill both the indoor and outdoor seating areas, providing plenty of room to relax. The Abbey is a favorite among UCSC students, and the popular indie music played over the speakers suggests it caters to its young clientele. Although the coffee is tasty, many come more for the live music and shabby-chic ambience than the espresso. The ample seating space provided by plush armchairs and couches makes it definitely a coffee shop to study in, as well as a fun place to spend a Friday or Saturday night. Just off High Street, it’s one of the most conveniently located off-campus coffee shops — just hop on a 10 and you’ll arrive directly outside The Abbey. Coffeetopia is a great place for no-frills, traditional coffee. In addition to brewed coffees, the menu includes espressos and teas, and they serve smoothies and bagels and pastries from local bakeries. If you get whipped cream on your coffee, definitely try the mocha whip — the rich cream blended with espresso and sweetened cocoa is reason enough to stop by. Coffeetopia’s Westside location is conveniently close to several bus stops, so you can easily hop on a 16 and be there in a breezy 15 minutes. The shop is a little small, so don’t expect to spread out your textbooks or study group across multiple tables, but it’s a very student-friendly establishment, so you won’t get glared at for hanging out and writing an essay. 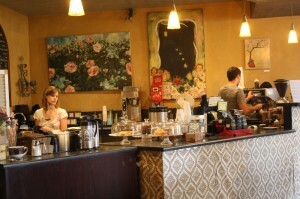 Like Perg’s, Coffeetopia features local artwork, but Coffeetopia does not offer live music. All in all, this is a great traditional coffee shop, a perfect place to sit down with a good book. While some shops focus on making drinks that taste more like a milkshake than coffee, Santa Cruz Coffee Roasting is serious about its brewed coffee and encourages its customers to be as well. The shop’s Coffee Learning Center offers classes on every aspect of coffee, from farming and sustainability to coffee appreciation and cupping. The baristas are friendly and happy to help, and they definitely know their coffee. It’s a busy place, so don’t expect to claim a table to study all afternoon. Live music, local artwork and late hours make Santa Cruz Coffee Roasting a desirable place to go with a group of friends, and the outdoor seating on Pacific Avenue is great for people-watching. If you’re looking for a great local frappucino, a Lulu’s Co­ol Cat is definitely your best bet, and offers the best flavor variety around. Located at the end of Pacific Avenue, the coffee shop is a bit removed from the hustle and bustle of the downtown stores but well within walking distance of the Metro station. The stores offers indoor and outdoor seating, where guests have a choice of a table looking out onto Pacific Avenue or on the back patio, where the high brick walls of surrounding buildings and tall plants give the place an intimate, private feel. Lulu’s serves great coffee and snacks, and it has the perfect laid-back coffee house ambiance. The music is loud enough that you can enjoy it, but quiet enough that you can easily read without distraction. The store tends to encourage this quiet and calm atmosphere, and seating is somewhat limited, so this isn’t the place to bring your entire group to hang out, but it’s a great place for one-on-one conversation. 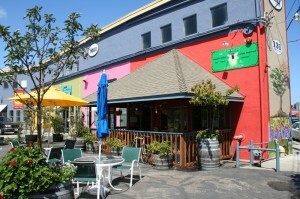 The bright colors of Firefly Coffee House, the local artwork and outdoor fire pit make it clear that this coffee shop has Santa Cruz cool, down to a “T.” The coffee is delicious, but save room for the very tasty pastries and snacks on the menu. 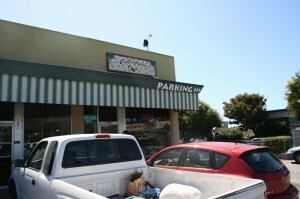 Clearly a student-friendly place, the coffee house offers students with valid UCSC or Cabrillo College ID a cup of drip coffee for only 50 cents. A customer at a nearby table told me that hanging out and studying is encouraged — she was going on her fourth hour in the coffee shop, just relaxing and reading. Students can make good use of the ample seating and study space. Hours: 5:30 a.m. to 4:00 p.m. on Monday through Saturday, 7 a.m. to 2 p.m. on Sundays. 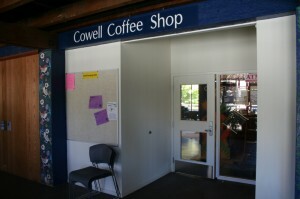 The Cowell Coffee Shop reopened last year, and though it’s smaller than the Stevenson Coffee House, Cowell is a great place to study. Seating is limited, however, so don’t bank on finding a table. The menu contains coffee drinks and sodas, sandwiches, salads, muffins, bagels and other snacks — notably their giant cookies, which students can enjoy on the large outdoor patio. The coffee shop is a good alternative to the dining hall if you’re stuck in a food rut. 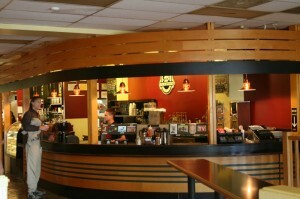 One of the most popular places on campus, Stevenson Coffee House attracts students from all colleges. On any given day you’ll find numerous students, professors and teaching assistants hanging out, studying or holding office hours. The shop is staffed by students who are in control of the radio, which means there’s usually a good mix of music genres being played throughout the day. 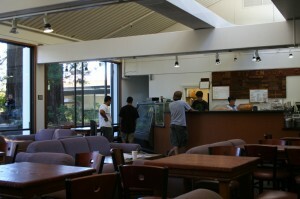 The coffee is good, and the pastries and sandwiches are even better — ask any UCSC student what their favorite on-campus snack is, most will tell you it’s a Stevenson Coffee House “fudgie,” a brownie-like dessert offered exclusively at the coffee shop. There is ample seating both indoors and out, but it’s a busy place, so you might end up sharing a couch or table.